Highlights of the opening round of matches in the evening session of the Grand Slam of Darts from Wolverhampton. 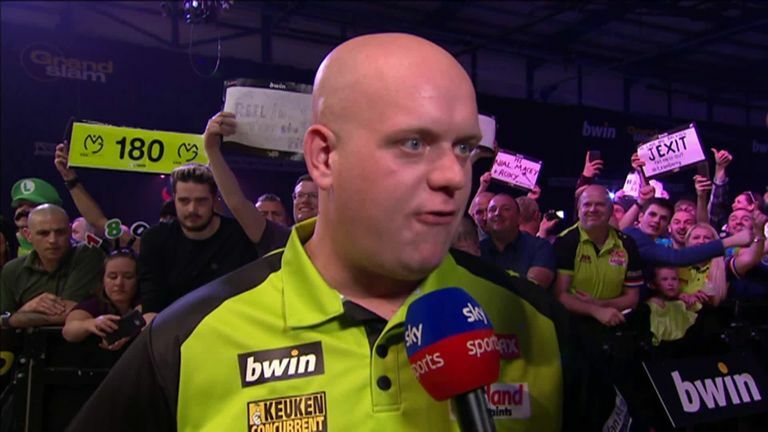 Michael van Gerwen delivered a blistering performance to beat Gary Robson and start his bid for a fourth successful Grand Slam of Darts title in style. The world No 1 is hoping it will be third time lucky having seen his hopes of a fourth successive title at both the European Championship and World Series of Darts recently halted by surprisingly early exits. In the first of his three group games he needed a little under 10 minutes to average more than 112, hit 50 per cent of his doubles and fired six maximums of his way to a 5-1 win over the BDO's Robson. In a tournament that tests the players' stamina with quickfire group stage matches followed by the longer format of leg matchplay in the knockout stages, Van Gerwen tends to produce his best with four finals and three titles in the last six years and it was more of the same on the opening day. Michael van Gerwen hit six 180s and averaged over 116 in his 5-1 win over Gary Robson. Van Gerwen also threatened a nine-darter on his way to victory over Robson who did well to secure a leg under the MvG onslaught and next up for the Dutchman is Jonny Clayton, the other winner in Group A.
Clayton beat Joe Murnan who missed a host of opportunities, but it was the Ferret who prevailed on his Grand Slam debut. 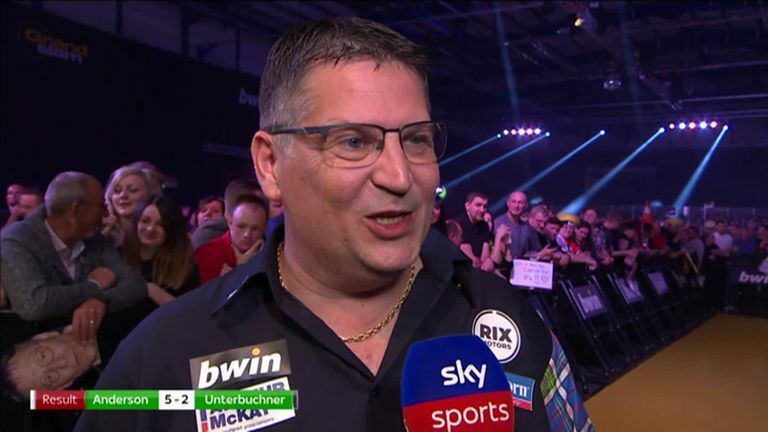 2014 runner-up Gary Anderson has made no secret of his desire to win the Grand Slam title and having picked up his first UK Open and World Matchplay titles this year, this is next on his list. However, he took a while to get his Group D campaign going against Michael Unterbuchner before recording a 5-2 victory. Anderson's German opponent took the opening leg and forged a 2-1 lead before Anderson found a typically brilliant 11-dart leg to level the contest and then power home down the stretch. From 2-2, the Flying Scotsman stormed to the final three legs for an impressive win and he will next face Ian White who showcased some of his best ever TV form. Averaging just under 105 the world number 12 blitzed Steve Hine, the Muffin Man who arrived on the stage dispensing muffins to the crowd but left with nothing more than a 5-1 defeat. In Group B there were mixed fortunes for the two big names as Michael Smith chalked up a frustrating win and Raymond van Barneveld was beaten by Krzysztof Ratajski - a man without a PDC Tour card. Ratajski has made a huge impression this year, winning a UK Open qualifier and two Players Championship events, that double enough to win a place at the Grand Slam. And he justified that with a 5-3 victory against Barney whose struggles continue; having led 2-1 and 3-2 he handed Ratajski chances which the Pole took to take another impressive victory. Smith will be Ratajski's next opponent after a 5-3 victory over BDO's Adam Smith-Neale, but 16 missed darts at double left Bully Boy frustrated. 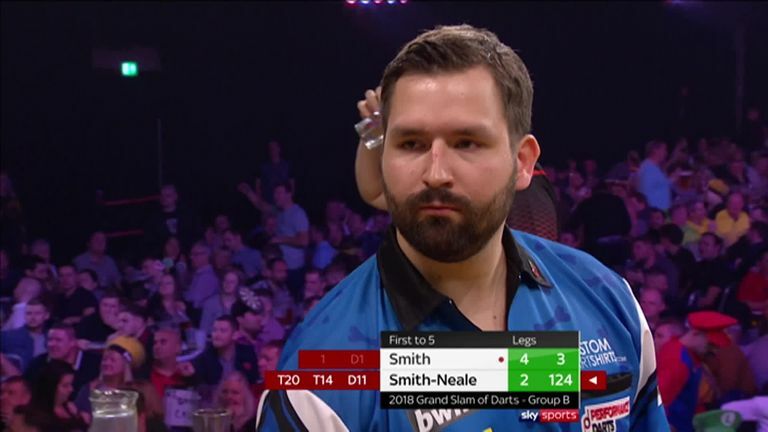 Smith raced into a 4-0 lead with a near flawless performance but having missed darts for a first TV title in Vienna, his doubling demons returned and Smith-Neale took his chances including a brilliant 124 check-out to close within one. Smith eventually got over the line but his frustration was evident. The Machine was too good for Wesley Harms, powering to the first whitewash of the week with a 5-0 demolition of the Dutchman. 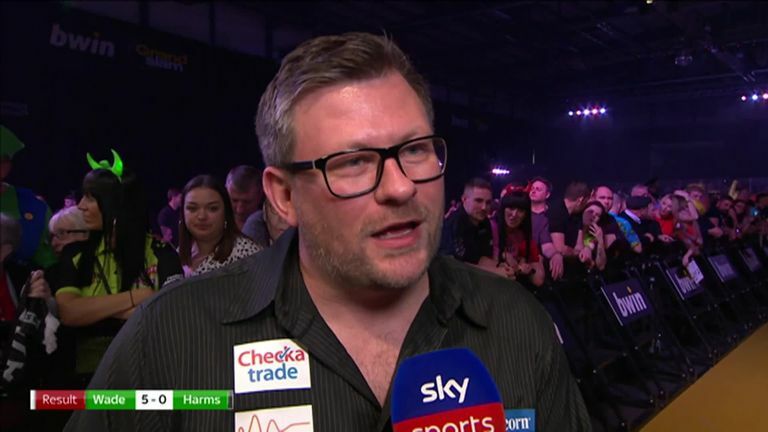 Averaging 120 over the first couple of legs, Wade barely gave his opponent a chance but as his level dropped a little, Harms was unable to take the chances that came his way missing all seven darts at a double. Wade will next face Keegan Brown who came from 2-0 and 3-1 down to beat Mark Webster in the battle of two qualifiers that kicked off the evening session. 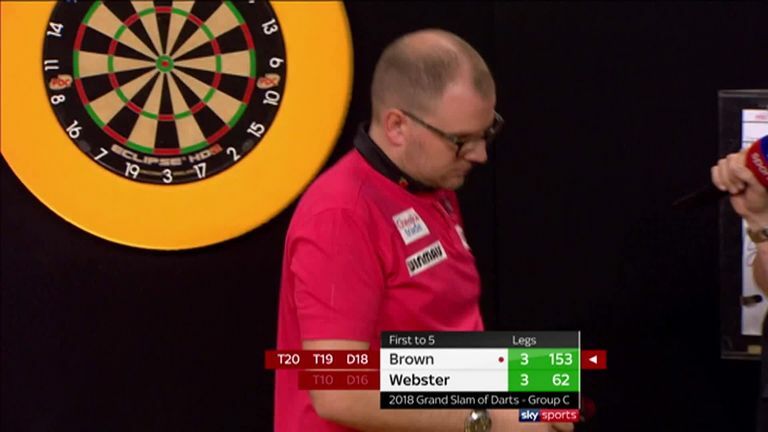 Neither made it through automatically but both came through Monday's Tour card holders qualifier in Wigan and it was Brown who prevailed, reeling in Webster after a slow start. The second phase of group matches sees the winners from today's session face off with the losers also meeting as they look to keep alive chances of a place in the knockout stage.